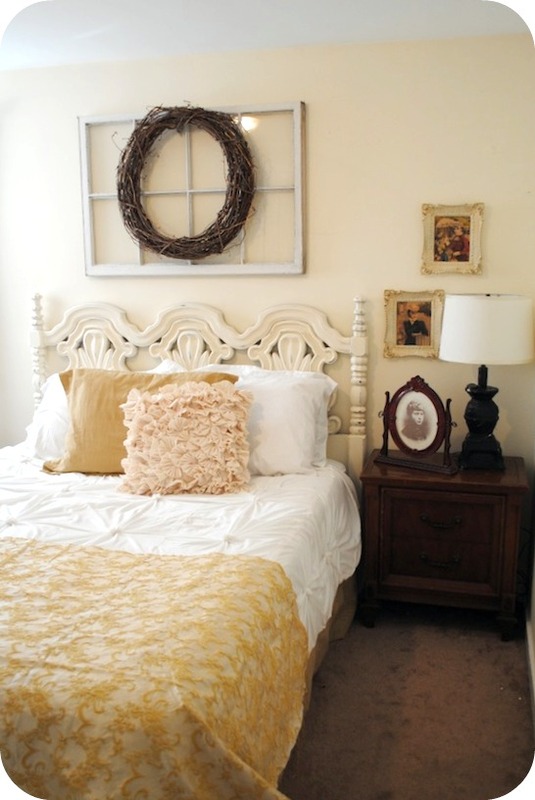 This headboard has definitely made the top of the list of my favorite finds umm… like ever! I got this at a local thrift store here in NY called Amvets and it didn’t have a price tag and I couldn’t tell if it was a full or a queen. I REALLY needed a queen. 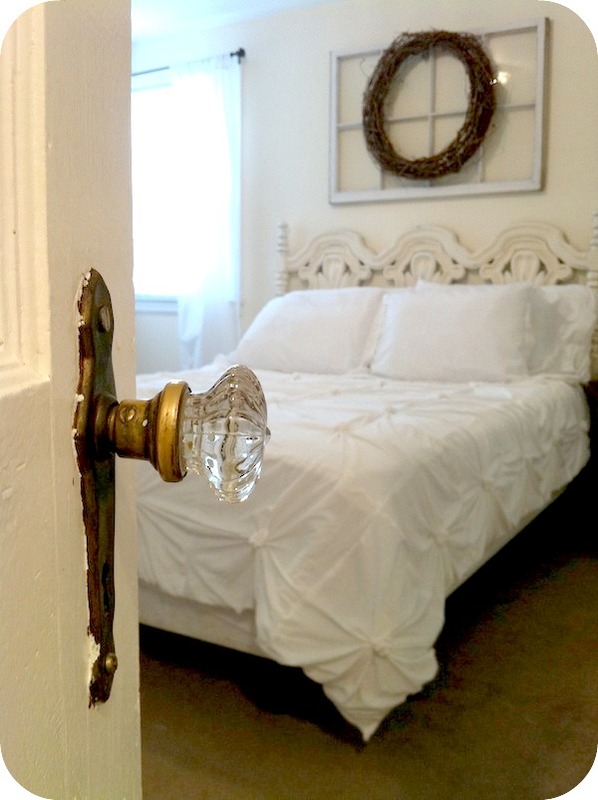 When I spotted it tucked away in the corner with all of the other run of the mill boring headboards, I knew she had to be mine! I may or may not have sent Savannah a picture message of it the second I found it! She always gets excited for me when I have great finds! BFFL right!? Somehow, I have LOST the before picture!! BAD, BAD BLOGGER MALLORY! I know. And I’m sorry! All I did was wiped it down really good. Primed it with Kilz Spray Primer and gave it two good coats of Rustoleum’s Antique White. Then, I took my sanding block and distressed it by hand! Easy! I am obsessed with the gorgeous detail of this piece! Oh yeah!! Did I mention it was $9.95!?? LOVE!! PS. You can see my Anthropologie Inspired Quilt Tutorial Here! I love that headboard as well. 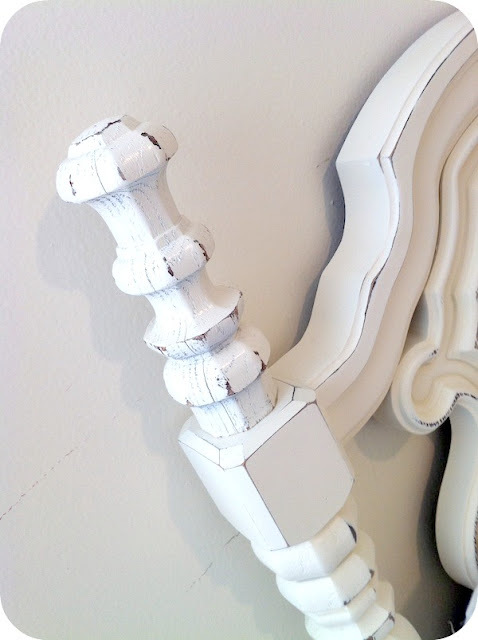 Such a great job of distressing–its lovely! Just found your blog. LOVE it!! I want a headboard like that!!!! http://www.paintinginportland.blogspot.com (I BARELY started a blog) keep it up! Great piece! I like that you kept it simple since to bring out it’s natural detail. Awesome! Oh I am so in love with this headboard!! I’m actually so in love with it it I’d love to feature it on my blog tomorrow. Let me know if that’s OK with you! BEAUTIFUL headboard, it looks stunning. What a find, what a find. Very nice! Love the detail and distressed finish. Just curious, where in NY is Amvets? SCORE!!! WOW… that is amazing. Don’t you love it when you find something so absolutely perfect for such a bargain? This is definitely the find of a lifetime. 🙂 It’s beautiful. When I saw the price I literally yelled “SHUT UP!! !” I love this so much! Obviously, I couldn’t even think of a better way to describe it then “Shut Up” Haha. What a great find! And the price! there are some awesome deals out there to be had for sure! 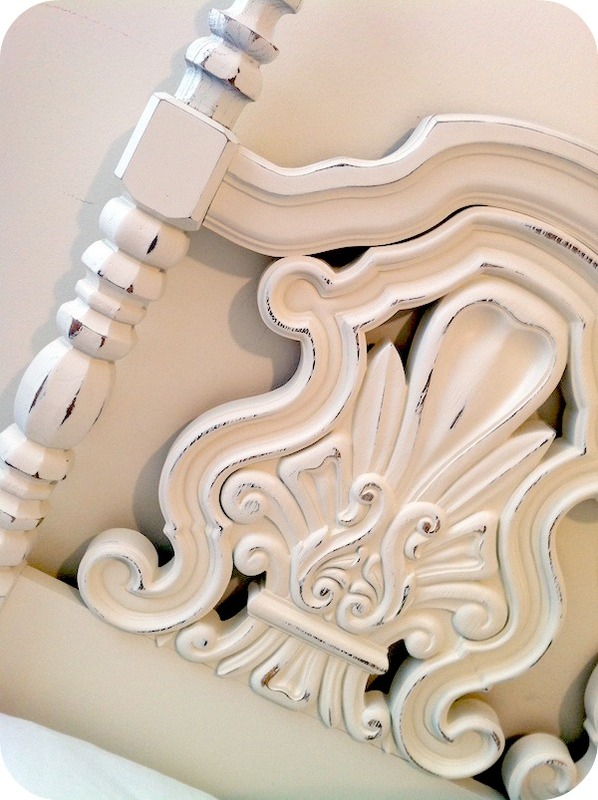 This headboard is GORGEOUS!!! Such an amazing find!! Did it have the maker’s name on it?